President Obama Gives Queen Elizabeth an iPod with These Show Tunes! President Obama gave Queen Elizabeth an iPod with 40 Broadway Showtunes. She in return gave the Obama's a signed picture of her and Prince Phillip in a Silver Frame. "If I Loved You," Jan Clayton, "Carousel"
"You'll Never Walk Alone," Jan Clayton, "Carousel"
"There's No Business Like Show Business," Ethel Merman, "Annie Get Your Gun"
"Some Enchanted Evening," "South Pacific"
"Diamonds Are a Girl's Best Friend," Carol Channing, "Gentlemen Prefer Blondes"
"Getting to Know You," Gertrude Lawrence, "The King and I"
"Shall We Dance?" Gertrude Lawrence, "The King and I"
"I Could Have Danced All Night," Julie Andrews, "My Fair Lady"
"I've Grown Accustomed to Her Face," Rex Harrison, "My Fair Lady"
"Seventy Six Trombones," "The Music Man"
"Everything's Coming up Roses," Ethel Merman, "Gypsy"
"Try to Remember," Jerry Orbach, "The Fantasticks"
"If Ever I Would Leave You," Robert Goulet, "Camelot"
"If I Were a Rich Man," Zero Mostel, "Fiddler on the Roof"
"People," Barbra Streisand, "Funny Girl"
"The Impossible Dream," Richard Kiley, "Man of La Mancha"
"Send in the Clowns," Judy Collins, "A Little Night Music"
"All That Jazz," Chita Rivera, "Chicago"
"Don't Cry for Me Argentina," Patti LuPone, "Evita"
"And I Am Telling You I'm Not Going," Jennifer Holliday, "Dreamgirls"
"The Best of Times," George Hearn, "La Cage Aux Folles"
"I Dreamed a Dream," Aretha Franklin, "Les Miserables"
"The Music of the Night," Michael Crawford, "The Phantom of the Opera"
"As If We Never Said Goodbye," Elaine Paige, "Sunset Blvd." Does Prince Charles wants to Become "President of Britain" ? HuffPo had an interesting scenario put forth by Johann Hari, which originally appeared in Telegraph UK....Charles wants to become a "political" president, much like that of Ireland, and Germany, where no election takes place- how do we know this....according to the story "Charles Windsor has just announced -- via his biographer, Jonathan Dimbleby -- that he is seizing the role for himself, without an election"
Matina Shakya, 3, Named Kumari or New Living Goddess in Nepal! A little bit of good news for a change. Matina Shakya took up her post today, clad in red and gold, in an ornate 15th century temple in Kathmandu after being named Kumari or "new living goddess" in Nepal. Shakya replaced the 11-year-old Preeti Shakya, who is approaching puberty and must retire. 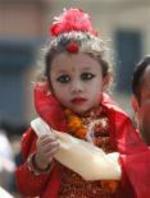 The Kumari is a major tourist attraction in Nepal and are considered by many as the incarnate of the goddess Kali. When the Kumari begins menstruation, she is replaced. Miss USA Crystle Stewart Falls During Evening Gown Competition in Miss Universe 2008- Video- Miss Venezuela, Dayana Mendoza wins Crown! The good news is Venezuelan Dayana Mendoza was crowned Miss Universe of 2008 held in NHA TRANG, Vietnam. But the video of Miss USA tripping during her evening gown entrance is going to be making the news. But she did have a quick and good recovery. This is the second year in a row that the Miss USA Candidate tripped during the evening gown competition, in 2007 Rachel Smith Miss USA tripped during the Mexico city contest. OOPS! Miss USA Crystle Stewart Falls!! Queen Victoria Undergarments to be Auctioned - Knickers: Split Crotch/50in Waist! and more! Recently discovered Queen Victoria Undergarments will go up for auction, they include knickers, chemise, nightdress, and bloomers. The garments have been preserved by the family of one of Queen Victoria's Servants. The UK Telegraph story focuses on the fact that towards the end of her life Queen Victoria was morbidly obese with a 50 in waist, and a 66 in bust. The auctioneers are expecting a lot of bids from collectors of Queen Victoria memorabilia. The average female waist in UK is 33 inches. No mention of whether this is a charity auction in the story. BTW, I had to create a new category for this post- Royalty!